There’s no way around it — people have a love-hate relationship with IKEA. Whether it’s to get overwhelmingly lost in their mazes of dream living rooms or kitchen set-ups, to buy little home gadgets you never thought you would need in the $5 bin, or to enjoy some Swedish meatballs, I’ve never seen someone so excited — and stressed — to shop for their home than when it’s at IKEA. If you’re searching for a new mattress from IKEA, we’re here to help. Skip all the meandering and continue reading. One of the more popular products IKEA sells is its mattresses and beds. According to a nation-wide survey, IKEA ranks 4th in sales out of all furniture and bedding retailers, trailing behind big names like Mattress Firm and Walmart. That’s not too bad, considering there are only 45 IKEAs in all of the United States. Their beds and mattresses are especially popular among college kids, who need something to sleep on without spending a lot of money. In fact, their MALM bed frame, a low, minimal bed frame is their third most popular item sold. In general, IKEA’s approach is a bit different than many of the newer online mattress companies. With 16 different mattresses making up its line and stores disbursed throughout the United States, IKEA places less focus on online sales and more on its in-store experience. Although consumers are able to purchase their mattresses online, there are so many mattresses to choose from, making the online experience tricky. (Plus, those meatballs…). 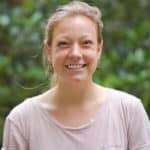 That said, we’re here to make the online shopping experience easier, so you have a better idea of what mattress could be a fit for you right from home. While mattresses may be one product among thousands on their product line, the company’s presence in the mattress industry is not something to ignore. In this IKEA mattress review guide, we’ll be analyzing and breaking down IKEA’s entire mattress line at a high level so you can have more knowledge on each bedding option before going online or heading to a store yourself. Should I Buy an IKEA Mattress? 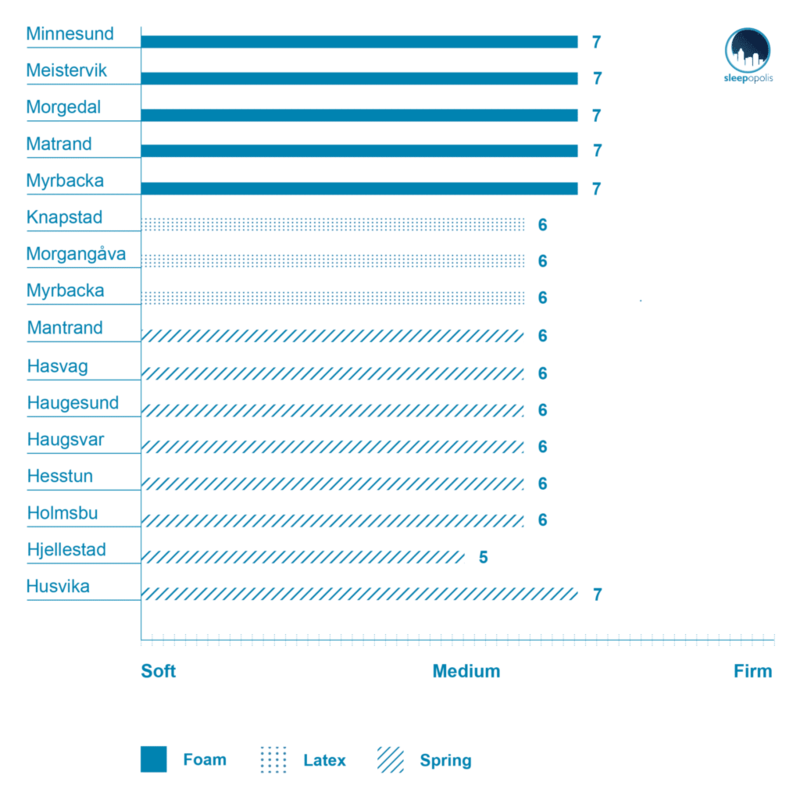 The following tables show comparisons between the foam, spring, and latex mattresses. Each table highlights the major functional components of each IKEA mattress. 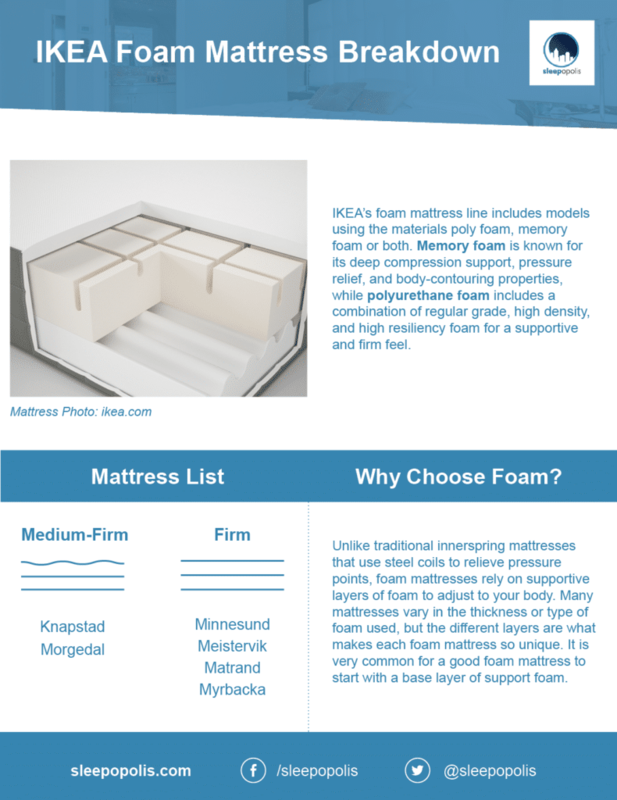 WHICH IS THE BEST IKEA FOAM MATTRESS FOR YOU? IKEA foam beds include both memory and polyurethane foam. Memory foam is known for its deep compression support, pressure relief, and body-contouring properties, while polyurethane foam includes a combination of regular grade, high density, and high resiliency foam for a supportive and firm feel. 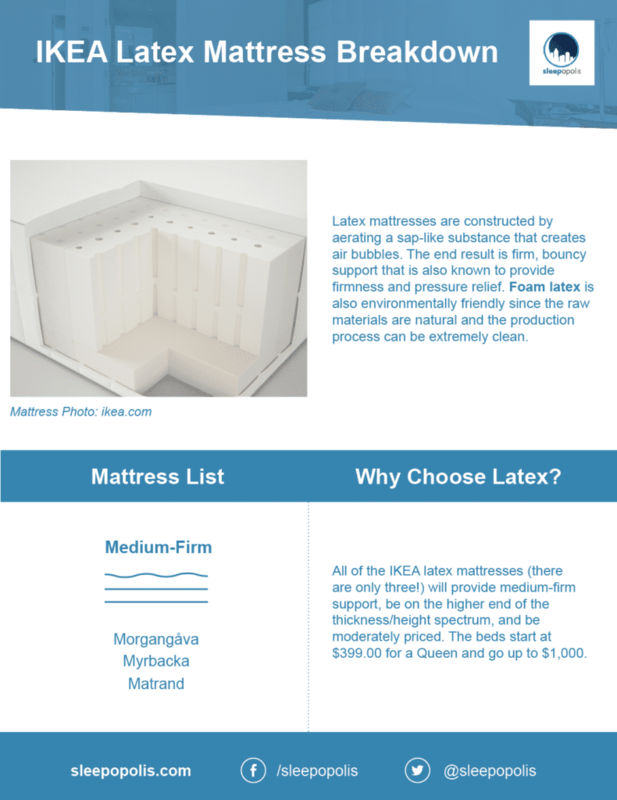 Latex mattresses are constructed by aerating a sap-like substance that creates air bubbles. The end result is firm, bouncy support and is also known for superior firmness and pressure relief. Foam latex is also environmentally friendly since the raw materials are natural and the production process can be extremely clean. Spring mattresses consist of lots of metal coils suspended in the other materials of the mattress. They offer a lot of bounce and good temperature control, supporting the body by pushing back a similar amount of pressure that the body applies. Even though IKEA doesn’t provide a range of softness for their mattresses, luckily, most Americans prefer a medium-level mattress to support their side or back sleeping habits. However, you will be limited in the type of bed you can choose from since only the IKEA spring and latex options fall into the medium to medium-firm spectrum. Pretty much all the IKEA foam beds are noted as medium-firm or firm (customer reviews tend to agree! ), so if you know you want something a bit softer, I would suggest trying a different type of foam mattress. IKEA does not sell any mattress that I would describe as slightly soft, soft, or very soft. Their softest options are most likely the Hjellestad option, which is perhaps relatedly also on the pricier side of the spectrum. That said, there are certain things you can do to soften your mattress up a bit, like adding a comfy mattress topper. However, the best option, in my opinion, is to test it out yourself, whether online or in a store. Luckily, IKEA offers a 365-day trial period with all of its mattresses, so you can buy one online for little-to-know risk. (Keep reading for all the trial-period details!) The difference between a 6/10 and 7/10 for firmness level is susceptible to subjectivity, and it really comes down to how your body feels on the bed. Having options to return or test beds is a great thing to take advantage of. HELP: What mattress firmness do I need? The six foam mattresses from IKEA are all generally on the firm side. If you’re a firm bed lover, then these could be a good fit for you, especially since they are, on average, lower priced than other typical poly and memory foam mattresses. It’s worth noting that these foam mattresses receive mixed reviews, so don’t jump at a reasonably priced mattress before doing your research. We’ll highlight common complaints and praises below. This mattress is the least expensive of the bunch, starting at $89 for a twin. The cover is removable and machine-wash friendly. The zipper is child-safe but there is no tab on the zipper. To open and close, insert a paper clip through the loop. The mattress comes roll packed and will take up to 72 hours to retain its shape. IKEA recommends a slatted bed base or a mattress base. The Meistervik is similar to the Minnesund but comes in at a higher price point because it’s about one-inch thinker. It’s designed to give all-around support with what IKEA describes as a “resilient” mattress. Still, it’s pretty thin, and many reviews said this bed, along with the Minnesund, are better for children than adults. Now we’re moving up a good three inches in height from the Meistervik. The Morgedal is 7 ⅛ inches thick and Includes comfort zones that target shoulders and hips to support pressure relief. The mattress cover is also removable and comes in two parts, so it’s relatively easy to take off and air out. The top part of the mattress is also machine-washable. This mattress is the same thickness level as the Matrand, but it has a memory foam layer on top. This layer is engineered to mold to the contours of the body to relieve pressure and promote relaxation. Still, you can remove the mattress top and throw it in the washer for easy cleaning. After reading reviews, the general consensus is people thought this was a good price for a memory foam bed — this mattress starts at $299 for a Twin. The Myrbacka also has a layer of memory foam, but it is two inches thicker than the Matrand. The thick layer of memory foam is filled with lambswool filling for temperature regulation and a soft feel. Similar to the Morgedal, the Myrbacka was designed with comfort zones that target the shoulder and hips. This is one of IKEA’s newest beds. It features a thick layer of memory foam topped with a layer of gel that aims to mold to the body while providing a cooling support. The Knapstad is also designed to be durable on one side only, so there is no need to turn the bed throughout use. The next level up on the latex line is the Myrbacka, which is just shy of 10 inches thick. There are holes inside the mattress allow the air to circulate while promoting a dry and healthy sleep environment. Just like it’s memory foam sibling, this latex Myrbacka has lambswool filling that is soft to the touch and helps keep you cool. The Morgongåva is the most expensive mattress IKEA offers on all of their lines. This mattress is made with natural materials that are designed to pull away moisture and provide a cool sleeping environment. This is not the thickest mattress — it comes in at just under eight inches thick — but it does seem to use the highest quality materials. Spring mattresses are known for offering great support by distributing body weight evenly. The open spring construction allows air to circulate as well, helping to keep you cool at night. The seven coil spring beds by IKEA are perhaps the most diverse line, offering beds that range from medium to firm support, and go from low to moderately-high price-points. This bed only comes in a Twin size and is made specifically for kids or to fit in a daybed. This is the most basic spring mattress offering from IKEA. The Twin starts at $129; the additional size offerings include Full and Queen. Still, it’s a relatively thick mattress (for IKEA, at least), coming in an 8 ¼ inches. The stretch fabric on top of the mattress moves with you, which is supposed to help maximize comfort and support. Like the Knapstad, this bed is designed to only be used on one side. The Haugesund bed has individually wrapped pocket springs that move independently are designed to follow your body’s movements. Additionally, the Response coils are individually wrapped, which helps insulate movements so you have good motion control and don’t disturb someone who is sharing your bed, whether a partner or a pup. This mattress is built similarly to the Haugesund but is almost two inches thicker. There is also a generous layer of high resilience foam on top of the mattress to help provide enhanced comfort. IKEA also claims that its high-resilience foam on top is great for pressure-relief and improves blood circulations to the muscles and skin to ultimate relaxation. The Hesstun comes with all the features of the Haugsvar — and then some. It has double layers of individually wrapped pocket springs topped with a generous foam layer. The mini pocket springs inside the mattress are designed to contour to the natural curves of the body to create an enhanced comfort and a firm, yet supportive, sleep surface. A Twin starts at $399. This higher-end mattress has an integrated memory foam pillowtop that is engineered to mold to the body’s curves and pressure points. The Hjellestad also includes double layers of pocket springs for precise support and is advertised as striking the perfect balance of plush support and firm comfort. 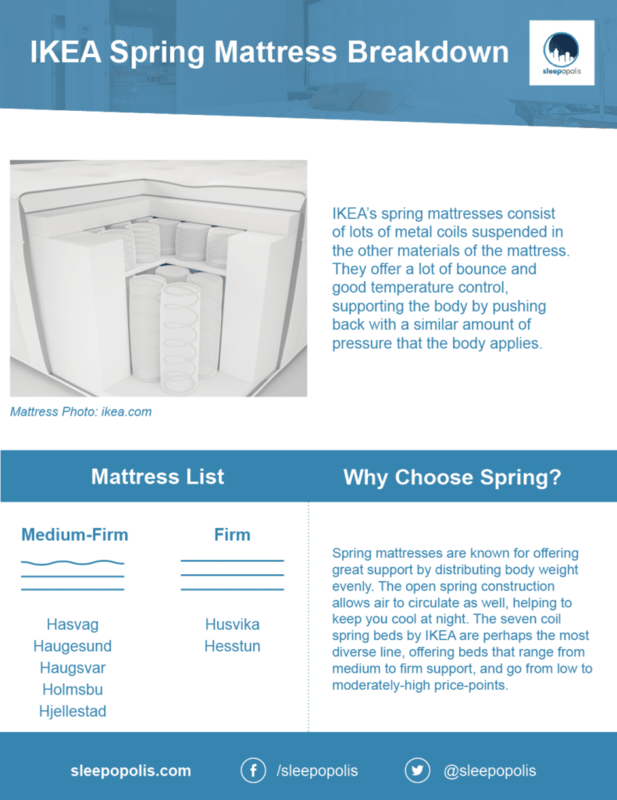 The Holmsbu is the highest-quality IKEA spring mattress. It’s also one of the thickest, coming in at 17 ¾ inches thick. The surface of this mattress is a cooling memory foam with a layer of mini pocket springs in addition to two layers of pocket springs — all of which are designed to support and cradle the body. This bed also seems to be the only one with an extra protective cover with handles on all sides, which makes it easier to carry and store. When the mattress is in place, you can simply unzip and remove the cover. Here are some candid comments and reviews from this line. Make sure to check IKEA’s website and Amazon for the full spectrum of complaints and praises. IKEA carries a total of 16 different mattresses, including one new mattress introduced this year — the Knapstad. Each one of these mattresses is unique in its own way, but there are a number of similarities shared by the entire line. The differences of each mattress will be shown in the next section, but here, we are going to focus on the commonalities you’ll find in all of the IKEA mattresses. Warranty: With every IKEA mattress comes a 25-year warranty. IKEA will cover “defects in materials and workmanship.” Normal wear and tear is not covered by this warranty. Trial Period: IKEA offers a 365-day trial period with all of its mattresses. If you find that the mattress is not the right fit, IKEA has a “Love it or Exchange it” return policy. Within those 365 days, you may return your mattress one time for another mattress in the company’s line. The mattress must be clean and undamaged if you do decide to return it. Refunds: You can return your mattress, but you must have your original receipt and the card used to make the purchase. If you can’t show proof of purchase, you may choose to receive a ‘merchandise credit’ for the lowest-selling price of the mattress. Shipping: Shipping costs for IKEA mattresses purchased online or over the phone vary depending on the city and state where you’re located. Their website states that delivery prices start at $29. Recycling Program: If you purchase a mattress from IKEA and have it delivered to your home, the company will recycle your old mattress for free. FAQ: Do I need a boxspring? Affordability. All IKEA beds are priced below market average, and the most expensive one still comes in below $1,000. 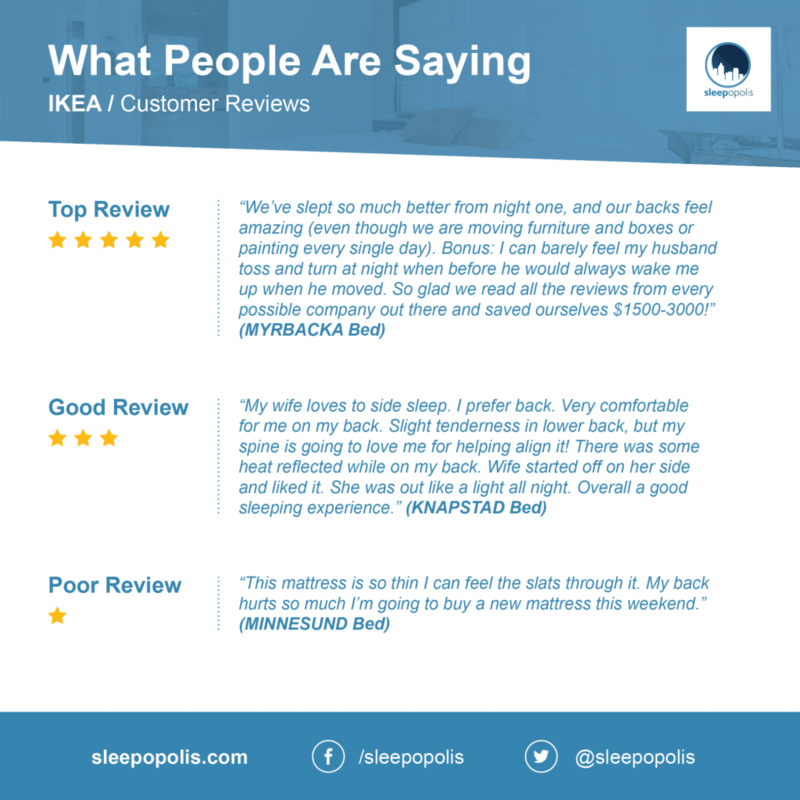 This is why IKEA mattresses seem to be popular among college students who are working with a tight budget or need a temporary bed solution. 365-night sleep trial. IKEA’s “Love it or Exchange it” return policy is a pretty good deal, allowing you to “risk-free” try a mattress and then exchange it for another one if you’re not satisfied. 25-year warranty. While normal wear-and-tear is not covered under this warranty, 25 years is a pretty nice amount of time to protect your purchase. Limited size options. Most IKEA beds (minus the ones for kids) only come in four sizes: Twin, Full, Queen, And King. While these are usually the most common mattress sizes, you don’t have as many options as other mattress brands that offer upwards of eight or nine sizes to choose from. No options below ‘Medium’ firmness. Like we mentioned above, all of these mattresses will be a medium level of firmness at a minimum. If you like super-soft beds, you are probably not going to enjoy an IKEA mattress. Below-average durability. Many customer reviews said that their bed would sag quite quickly or tear easily. Unfortunately, it looks like there might be a correlation between price and quality. When you purchase an IKEA mattress, you’re getting just that — the mattress. While this is typical among bedding companies, IKEA luckily offers a handful of other bedding products to help build your bed. And just like the mattresses themselves, there are a lot of different products to choose from that come with a super fair price tag. IKEA offers 18 different bed bases to choose from. These include slatted mattress bases, spring mattress bases, bases with legs, bases without ‘em, and bases with secret storage spaces. Most of these bases fall under $200, with the only outlier being the new Godfjord base that is $539. Since IKEA mattresses are notoriously firm, it might be a good idea to invest in a pillow top. In fact, many reviewers said they purchased a pillow top to help add some plush softness to their supportive mattress. There are four different pillow tops to choose from, that range in price from $99 to $299. If you want a mattress or pillow protector, you have eight to choose from — four mattress protectors and four pillow protectors. In general, these are great to have since it helps protect against dirt and stains. Most fall within $20-30, too. Depending on the base you choose, you might also want a slatted bed base to get extra support. IKEA has two that are under $100 and also has an adjustable slatted base for $210 that allows you to move the head and base of the bed. If you want a taller bed, IKEA sells bed legs of all various shapes and sizes. Materials range from wood to stainless steel. IKEA has 18 different pillows to choose from. Materials include down and feather, lyocell comforters (renewal and natural), and polyester. Some are specifically designed to keep you cool, and others are to keep you warm. A few models come in different colors, but for the most part, these comforters will come in white. If 18 comforters weren’t enough, try 20 different pillows. In typical IKEA fashion, its cheapest pillow starts at $1.99. The various styles are made from either down and feathers, memory foam, or polyester, and come in a variety of thickness. The covers are made from a natural and renewable material called lyocell. You’re on a tight budget. The best perk about IKEA mattresses is their price-point. They are priced below market value and also come with good trail periods and return policies should you decide it’s not a fit. Moreover, IKEA mattresses aren’t as high of quality as higher-end mattresses that come with bigger price tags. That said, if you need a bed for a temporary reason — a sublet in a new city, a college dorm, etc — then these mattresses would generally be a good fit, especially since it wouldn’t be a huge investment. You prefer firm beds. All IKEA beds will feel pretty firm, if not really firm. If you’re a firm bed lover, you most likely can’t go wrong with the support and feel of these beds. You want options. IKEA has a ton of mattresses to choose from, along with a variety of other bedding products to complete your bed setup. Some are slightly different when it comes to height and support, so you can choose one that you believe best supports your body and needs. For more information on what to look for when picking out a new bed, check out my how to choose a mattress guide. The IKEA mattresses are budget-friendly, providing an average value. The material choices, layer thickness, design, and overall profile of both mattresses I tested leave something to be desired in terms of performance. While I do appreciate IKEA’s objective to offer inexpensive mattresses I feel like there are better mattresses for the money elsewhere.